More commentary on the Crimea film. What finally became clear to me personally is that it was not the Western pressure which influenced Putin’s decision not to send the army into the Donbass. Now we can clearly see that when it comes to the Crimea, Russia’s resolve was demonstrated up to and including the “nuclear briefcase.” In other words, just try something, and you’ll be talking to ballistic missiles. This was improbable even during the best years of the USSR. It tells us that if a similar decision were to be taken concerning the Donbass, you’d see a similar operation, and there would be no clash with NATO—it would drift away. The obstacle was somewhere else. This deserves close consideration, and not throw about phrases like “how is the Donbass less Russian than Crimea?” This is faulty logic at work, and it was never part of Putin’s thinking. The problem is somewhere else. Donbass is not a peninsula which can be blocked by cutting off the isthmus. If one sends troops into the Donbass, then the frontline becomes longer with every kilometer West, from the Black Sea to Belarussian forests. Therefore if one enters the Donbass one must march, as a minimum, to the natural border of the Dnepr, but that’s Poltava, Sumy, Chernigov, Dnepropetrovsk with their populations, a significant part of which had already been zombified into Russophobia. With every kilometer we’d get a less pro-Russian and more Russophobic (I know this on the basis of examples). 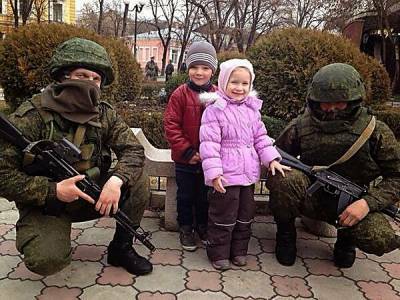 The junta was able to sway people’s minds already by March, April, May, so that one could not expect a full support for the Russian Army even in the cities of the Larger Novorossia, not to mention Vinnitsa. This is an important point which Putin underscored both earlier and at the anniversary of Crimea annexation: he based his decision on the potential support by the population. Crimea was fundamentally ready for the arrival of the Russian Army (it was already there, which made the task easier). But the rest of Ukraine was not. Even in Donetsk a large proportion of local “white collars” and housewives turned out to be Maidan support and ran away from the DPR and LPR. This is not a criticism of the Donbass, but the sad reality for which we are all at fault. Those who stayed on the Donbass paid for their choice in favor of the Russian World with blood, and there isn’t enough marble in the world for a monument to them. But the Russian Army would have had to march further than Donetsk, to Melitopol, Zaporozhye, Kherson, Nikolayev, all the way to Odessa. There are lots of Maidaneks there. And even more people who very quickly accused Russia of aggression. Look at how people behaved in the border town of Sumy, where nobody is so much as stirring against the junta. Once again, it’s not their fault but ours in general, as is the pain and sadness. Look at how much importance “tyrannical” Putin attaches to people’s sentiments and desires, even if those desires are imposed from the outside. Now we know for certain that the Kremlin was conducting opinion polls constantly and everywhere—in the Crimea, on the Donbass, in Russia concerning both Crimea and Donbass, and in the various regions of Ukraine. One can criticize VVP for this, but he does not want to do anything that does not have the support of the inhabitants of a given territory. He acts in a similar manner in Russia—he makes a decision only when the people are ready, or even more than ready, for it. I think that’s due to an understanding that the government’s actions are truly historical and make lives better only when they are based on the desires of the majority of the population. When the government and the citizens are acting as a united front, it leads to the government of the people (unlike democracy, in which power belongs to the 2% who are democrats). Already in March Ukraine was not prepared to welcome the Russian Army as a savior. Marching only into the Donbass would have been a half-measure that would have escalated the conflict and put Russia in a dead end. The decision not to send troops into Donbass was painful and forced, but at the same time the most correct one. If one considers the reality, not desires. Life is like that.